I paid 40 lira for the ferry ticket and €10 (roughly 20 lira) for port tax. So, altogether 60 lira. 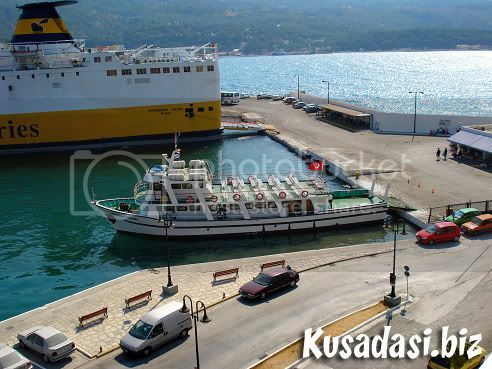 You can purchase ferry tickets to Samos from a number of the travel agents around Kusadasi, some already include the port tax into the price, whilst with others you have to pay on arrival at the harbour. 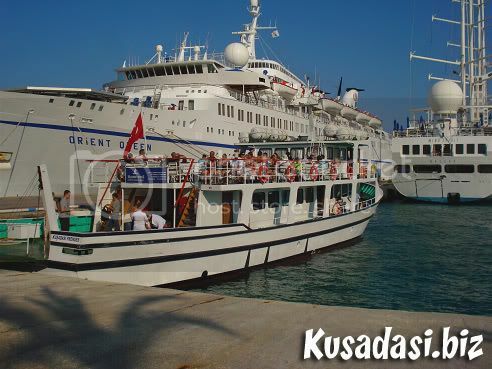 The boat leaves Kusadasi at 8.30am, and you should arrive 30 minutes prior to departure. If you have booked with a travel agency then transport from your hotel to the port is usually included. Walk right through the Scala Nuova Shopping Center heading right until you arrive at the Cruise Ship entrance. Once you're at the Departure gates, you will see passport control where your passport will be stamped (whether or not you want a new visa on the way home) and you will be issued with a boarding card. 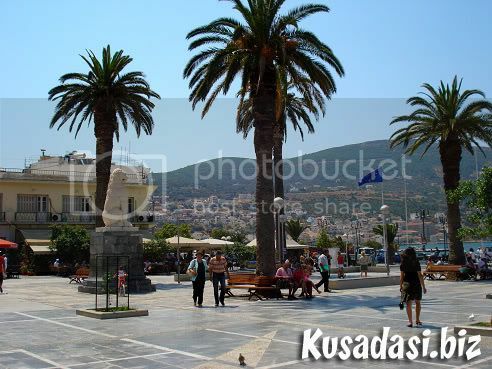 You'll find the Duty free shop where you can purchase goods, but remember you will have to lug the bags around Samos for the day, so perhaps it's better to go there on return to Kusadasi. When you walk out of the Departure building you will be directed to the ferry where you hand in your boarding card and then find a place to sit. You will not need a boarding card for the way home, so don't panic. The ferry we went on is small with an upstairs seating area, aswell as an indoor area and seats around the sides. There's a small cafe inside where you can purchase drinks. At that time of the morning, most of the boat were inside catching up on the sleep they missed that morning. After a long journey you arrive at Samos' main port 'Vathi' located on the North-East part of the island and built amphitheatrically around a bay. It has a population of about 9000 inhabitants and old Venetian and neoclassic buildings blend with the new ones, forming an attractive scenery. Once off the ferry, you have to go through the Greek passport control and then you're free to explore Samos. I had heard from so many people that a day trip to the Island was about as fun as watching paint dry, but I actually liked it there - it was a peaceful and relaxing day. The Greek people are really welcoming and you'll hear 'Yassou' (pronounced YahSU - meaning hello) constantly from the friendly locals. 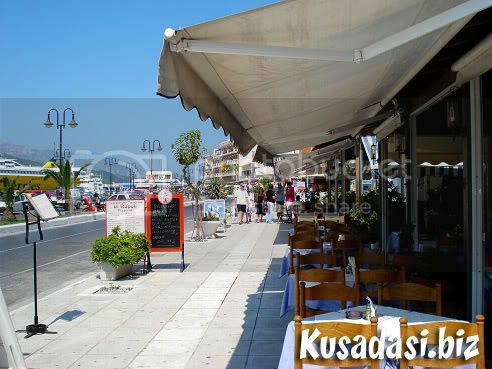 The town area around the port was very similar to that of the Island of Chios, with lots of waterfront cafes and restaurants scattered around the bay. Prices do vary and most of them have their menu on display outside so it's worth a look before you go in. You can't spend Turkish Lira in Samos, and if you didn't get a chance to change your money into euro's in Turkey, there are a few banks with ATM's around the town and along the waterfront where you can withdraw cash. The one thing I should mention is that they have a siesta in Greece, which means all the shops close from around 3pm until 6pm, so it would be a good idea to get all your shopping done first and then go and have lunch once the siesta kicks off. The streets are deserted during the siesta time, but the cafes and restaurants fill up. The Greek food is really delicious, we found a hidden restaurant in a secluded garden where we had a lovely meal. I can really recommend a Greek salad and 'tzatziki' (a creamy combination of yogurt, cucumber and garlic) although they have it in Turkey, the Greek version is scrumptious. Samos is one of the biggest islands of Greece - although there's not a whole lot to see or do around the port area once the shops close. If you want to explore you can hire a car, bicycle or a scooter and see the Island better. There are lots of old fishing villages such as Pythagorion and Ireon, picturesque towns, ancient sites and museums around. The Tunnel of Eupalinos, a major aqueduct, was built in the 6th century BC to bring water to ancient Pythagorian and runs for over a kilometre through the hills. You can walk for some distance in the tunnel as it is now fully illuminated, although it's not recommended if you suffer with claustrophobia. To the northwest of Pythagorion inside a big cave you can find a monastery devoted to the presentation of the Virgin Mary. The museum houses a collection of items used in the daily life of ancient Samians, pottery, coins and small objects made of bronze along with female statues,. The most impressive statue however is the majestic, five metre-tall kouros, discovered, like most items, at the Heraion sanctuary in 1980. According to Greek mythology, the goddess Hera was born on the site of the temple. The site is vast and complicated and only one of the original 135 columns remains. 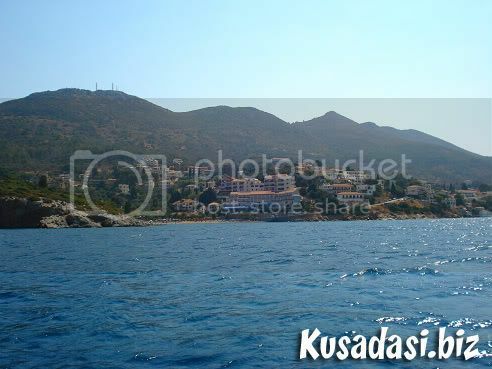 The area of Potami, located west of Karlovassi, is one of the most beautiful areas of Samos. A walk along the river through the forest leads to a small lake and the Potami waterfalls. We went into Hotel Samos which is opposite the port where we were allowed to go up onto their roof top swimming pool for free and chill out there until it was time to head home. If you're looking to kill a few hours before sailing back to Kusadasi, Hotel Samos' roof garden is a great place to sit/swim/drink and watch the world go by as the views over the bay are beautiful. 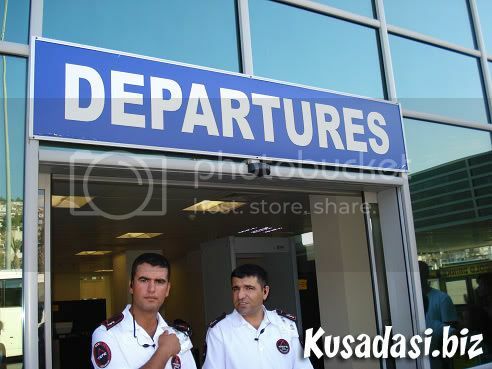 Once you arrive back in Kusadasi you enter the arrivals area where you'll be able to obtain a new visa, go through passport control and visit the duty free shop if you wish to do so. 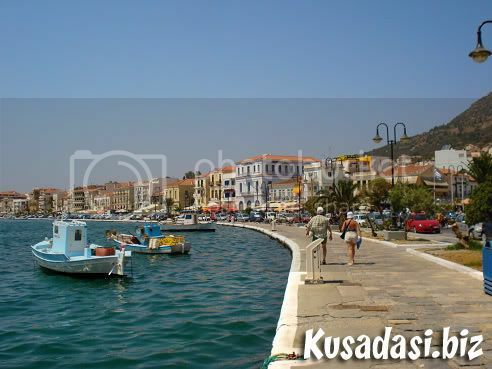 Samos looks very cute and peaceful place. Thanks for the wonderful info Mella, we are due to go this coming weekend to renew our visas. Christine, I heard that the ferries operate every day between 1st of April and 31st of October. Excellent and very well researched post Mella! My friend was there today, a short taxi ride to the other side of the island takes you to a gorgeous beachm about 8 euro for a taxi, its a pebble beach but a few metres into the sea it becomes sand. I was there yesterday and had a good day as decided to explore a bit more this time. Rented a motorbike and just drove around a bit. Stopped at one point which must have been the closest part to National Park over here and could even see a big Turkish flag in the distance. My aunt and uncle love greece and went to Samos a couple of years ago to visit friends. They had nothing but praise for the island they stayed in a town called Pythagorio which they said was lovley. 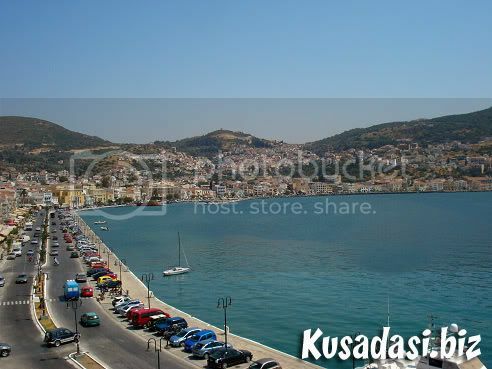 Youve actually made Samos look good, Well done. 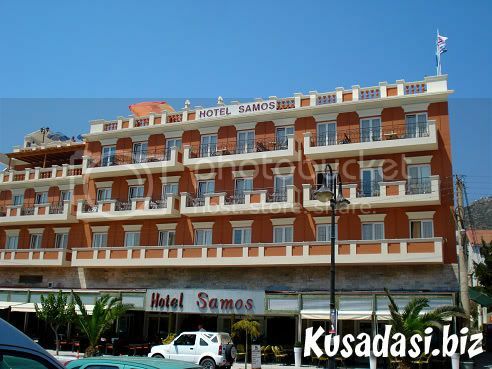 Think I try the samos hotel to fall asleep in next time Thanks for the tips and that beach looks good aswell. 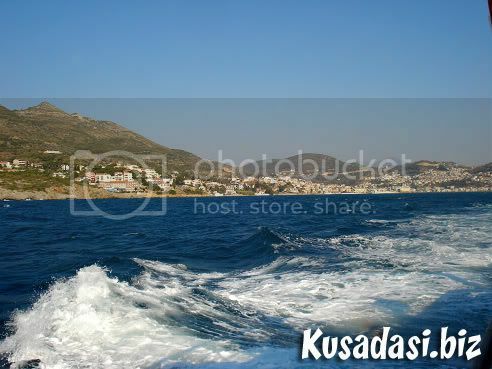 But I have to say Kusadasi beats Samos on every front but its just handy for visa runs. nice story and pics, greece is very pretty. Samos is a beautiful island and it often gets overlooked by a lot of the tour companies. I went to Greece long before i discovered the wonders of Turkey and it was on a day trip to Ephesus, from Samos that i fell in love with Kusadasi. It's both similar and different to Turkey in many ways. There are no 18-30 types, no Macdonald's and no hassling to go into restaurants, bars and shops. Its probably not for those that are looking for a buzzing time, but would be suitable if you are if you're a clapped out and need a rest or are a couple looking for a romantic holiday. We hired a car from a company called Pegasus and took ourselves round the Island though buses and taxis are readily available. I went to Samos last year to get a new visa, it was the first time and i was all on my lonesome so it was pretty boring but the town itself was very cute the boat journey was horrid it was windy and its such a small boat it was being rocked around people were lying down anywhere they could. ill have to go this year again i hope i can find someone to go with me this time. Gorgeous pics and review of the island, i probably wouldn't go because i wouldnt want to waste a moment of my Kusadasi time (ive waited a year to get there again!!) but it does look like a nice day out. Have always thought should we go or not, asked around and have only had bad things about Samos from people that have been, the pictures and write up do sound jolly good. When you dont live in Turkey and you only spend a certain amount of days there a year you dont want to waste them.